Yay! 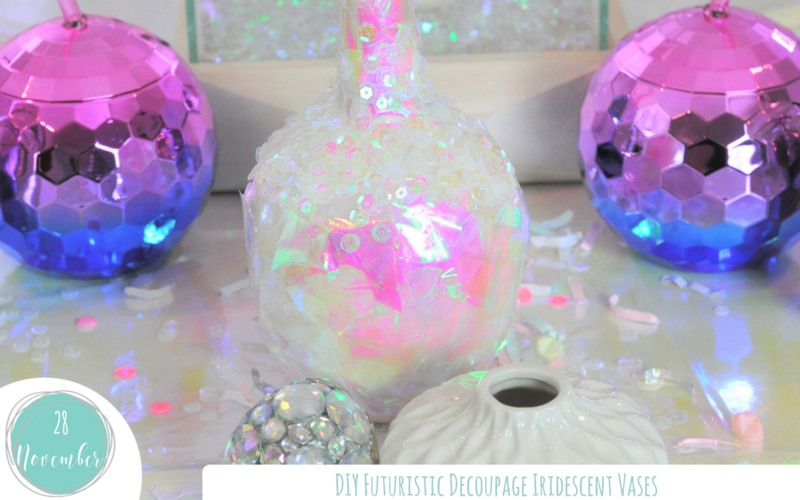 To keep those fingers busy until the full plan is available why not try your hand at this super easy and fun DIY decoupage craft that uses some fun materials to create a fab futuristic, future-forward look for vases and other ceramics. You’ll find all of the supplies you need to bring your vases into the future on Oriental Trading in the Party Supplies and Craft sections. Cut up the Iridescent Wrapping Paper in preparation for decoupage. Adhere the Iridescent Wrapping Paper on the bottom of the vase using the Modge Podge® and a brush. Layer the pieces of paper on top of each other with more Modge Podge® until you get the desired look and thickness. You can cover the whole vase or just a portion of it for example just the bottom of the vase. I left rough geometric edges rather than an even edge which I felt fit better with the futuristic feel I was going for. Let it dry. Next, adhere the sequins onto the vases with the Modge Podge®. Use the same method applying the sequins in layers until reaching your preferred look and depth. Let dry. Note: You can apply the sequins, as I did, on top of the paper. Or alternatively, you may prefer to just Modge Podge® the sequins directly onto the vase with no paper underneath. I hope you enjoy playing around with this fun craft that is easy for adults and children alike. I loved it and am in love with the fun, flirty, future-ready look! Bring out your inner unicorn and celebrate 2018 with iridescent!